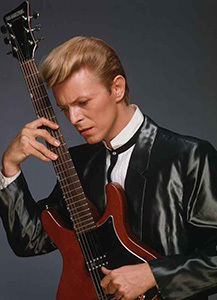 While 1989 got off to a great start with Bowie undergoing a rock colonic to blast all of the trite and ill-advised pop traits out of his system courtesy of Tin Machine, the end of the year featured the good news that Bowie’s impressive and untouchable of late back-catalogue was once more coming back into print on the shiny silver discs. Bowie and Mainman had taken ownership of his masters [say what you will about Tony Defries, but he negotiated this important proviso that is the salvation of the few artists who can claim it on their label contracts] by this time they had left the stewardship of RCA and had reverted back to the artiste. It was announced that the idiosyncratic CD-only indie label Rykodisc would be releasing all of Bowie’s pre-EMI material so that fans could once more buy the material that had been out of sight in stores for several years. 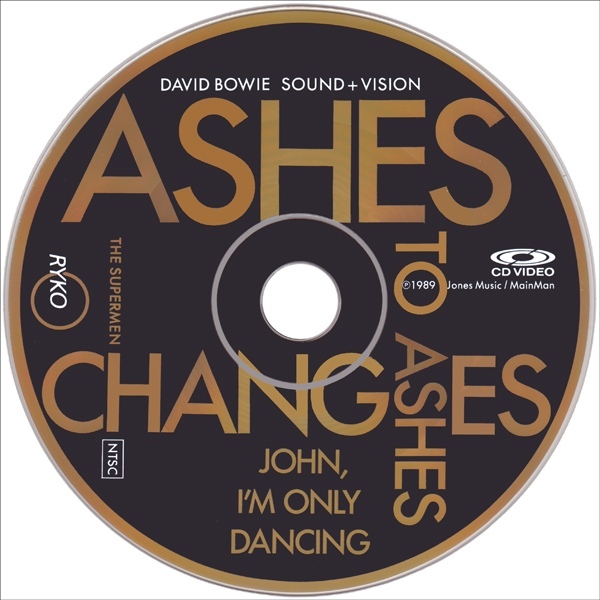 This would begin in the next year, but to tide fans over and whet the appetite [not that it was slacking – OOP RCA CDs were exchanging hands on the gray market for more than I could pay by this time], Rykodisc would be releasing a four disc Bowie boxed set covering his RCA career in depth and detail. I remember buying the “Sound + Vision” boxed set the week of release. It was even stocked in the Costco my family were members of, so I got it at the lowest possible retail value. The three CDs each had three tracks from each album period. The set was salted with about a third of the tracks being rare or previously unreleased versions. Some of these were previously unknown to me, like the radically remixed US single mix of “Rebel Rebel,” with its phased and percussive [and shorter] take on the Bowie rock classic. It was fun hearing the demo version of “Space Oddity” kicking off the set in an appropriately rare fashion. There were more rarities early in the set’s running time, but all of it was of interest. Of great interest to me in 1989 was the fourth disc. It was a NTSC CDV, or CD-Video. The strange format was a 5″ disc with 20 minutes of digital audio and up to five minutes of analog [yes, that’s right] video. The music would play in any CD player, but the video would only play in a laserdisc player… which by 1988 I most certainly had. The disc had three previously unreleased live tracks from 1972 in Boston with the video being the stellar 1980 clip for “Ashes To Ashes.” The quality of the video surpassed anything I had seen previously at that time, so I was a happy camper. The design of the box was also superb, with it winning the Grammy® award for best package design that year. 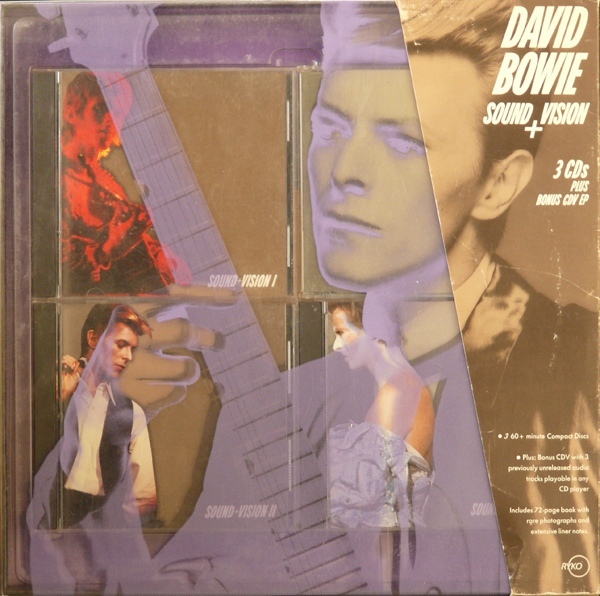 The images of Bowie from each era were on the covers and the inner box tray art was printed also in purple on the plastic lid giving everything a multi-leveled, series of intersecting dimensional planes going through the set from bottom to top. The set sold exceptionally well for something that cost in the $50-60 range at the time. 200,000 copies were sold in a year and the box got a gold certification of 500,000 sold by 1995. That made a huge difference in finally hearing material that I had only read about previously. The care of the compiling ensured that if you had only this set on a desert island [and a solar panel for your CD Walkman®] you would have little to complain about. Listening to it from start to finish was a very rewarding experience. There were few artists who covered as much stylistic territory and as adroitly as Bowie had done it. Bowie’s catalog was coming back to the hands of his fans. And the re-issue program would begin the next year, along with one other event. This entry was posted in Bowie, BSOG and tagged 1989, boxed set, David Bowie, Rykodisc, Sound + Vision. Bookmark the permalink. Sound + Vision is pretty amazing, being Instantly and equally collectible and essential. It held pride of place among my records/cd’s for a number of years. I must admit I was slow to double my Bowie collection on CD once they came out. I have most but not all. Bowie, at least RCA Era Bowie is a vinyl animal for me. Echorich – I too, was slow to buy all of the Rykos, as we shall see later. I too have this set of course, though I fear the Florida humidity hastened its deterioration even as I was putting it into storage those many years ago now.The discs are probably fine, but I’m concerned about the plastic “lid” more than anything else. As for the contents, as you say … a most rewarding listen! chasinvictoria – If the plastic lid gets moldy or mildewed, simply wipe it with a wet towel. No problem. I can tell you that it’s the paper booklets that are your most vulnerable part of that collection!